More on that train race out west that I wrote about earlier this month. Metro, the transit agency in Phoenix, is asking the state for $1.7 billion to accelerate construction on the 57-mile light rail system that is being built, and to add more than 20 new miles to the system by 2027. This according to the Arizona Republic. In both places, just as here in Michigan, there was plenty of skepticism about the value of light rail, whether people would make the mode shift from their cars to a train, and whether the investment would pay economic dividends. And in both western cities the answers are that trains are more popular than anticipated, and are encouraging $billions in new housing, retail, office, and recreational investments. 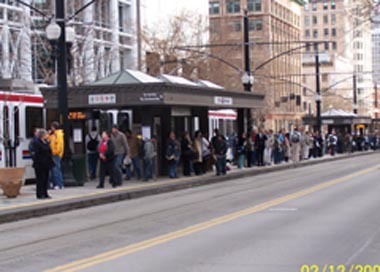 As an icon of a region’s will to succeed as an energy efficient, environmentally-conscious, modern, and prosperous place, rail rapid transit has few equals. Look at Utah: low unemployment, rising job numbers and incomes, well-educated workforce, mecca for young people, vibrant, and building the West’s second largest regional rail system next to Denver’s. Look at Michigan: nation’s highest unemployment, rapidly diminishing job numbers and personal income, workforce not yet convinced that college degrees are worth the trouble, treats its brightest young people as a primary export, troubled spiritually, and still arguing about whether rail transit has a place. In an interview on Michigan Radio earlier this month, Michigan’s Democratic Governor Jennifer Granholm said that public transit, and especially trains, were a “necessary” investment for the state to make to be competitive in the global economy. A starter line that links Ann Arbor with Detroit, and the suburbs in between, is now teed up for regional and state approval. There is $100 million in federal funding to complete the engineering and design stages and start construction. The familiar crticisms about cost, popularity, wise investment and the like surround the proposal. The typical critics — Oakland County Executive L. Brooks Patterson, House Republican Leader Craig DeRoche among others — have aligned to derail the idea. But for the first time in years, there also is a political opening that makes sense. Gov. Granholm says she wants more transit. And state Representative Marie Donigan, a Democrat of Royal Oak, was appointed chair of the new House Public Transit Subcommittee. Marie is southeast Michigan’s most prominent elected transit advocate. Get in touch with her at mdonigan@wowway.com and tell her you want to help. Exciting stuff Keith. Although I realize that to sustain the system, the suburbanites and daily commuters are the ones who need to make the modeshift, I can’t help but think of the personal convenience regional rail would provide myself; and I’m sure I’m not the only one. I mean how cool would it be to hop a train to a Tiger game? Swill a few brews, pop some peanuts, and enjoy the game without the hassle of driving or finding a parking spot. Now that’s exciting.